Interlocutor: Now I want to move on to another topic... Does a left-hander have a twisted spirit? Ruanel: No, what are you saying? There is nothing like a “twisted spirit”. Where did you get something so absurd? Ruanel: It’s directly a different conformation of the mental decoder. Nothing else than that, a different conformation. 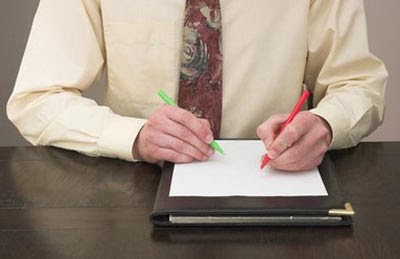 Interlocutor: Are the skills between a right-hander and a left-hander the same? Ruanel: Absolutely. And left-handedness is not an impediment, error, problem, or anything like that. I repeat it, so there is no doubt; it’s only a different conformation of the decoder without any other connotation. Interlocutor: Could I give the example of a clock which numbers are read to the left and the pointers also rotate to the left? Ruanel: The example is valid. In both ways the clock would indicate the hour and with the same precision. With a left-handed person the same thing happens exactly. Interlocutor: I thought that it could be a karmatic problem or something of that sort. Ruanel: No, no, discard that completely. When you publish this, don't give at any moment the impression that it is a problem or an error because it is not a problem at all. This entry was posted at Tuesday, December 22, 2009 and is filed under Concepts . You can follow any responses to this entry through the .